Damocles Edge wrote: Can anyone tell me for future reference if there is a protocol to follow for docking and paying fines? Any way you can, I think is the answer here! It looks like Smugglers might be making it a bit too hard - I've opened a discussion about this in the Smugglers thread to see if a solution can be found that avoids the "I just removed Smugglers" option. As for the docking HUD over normal HUD, I should get a patch out for this shortly. Thanks for letting me know. Damocles Edge wrote: The 1st issue I was aware of is that my forward view was being "quartered" (a long vertical line running through the view being intersected at the centre by a horizontal line). I've just released a new version (1.5.11) which hopefully fixes this issue for you. My difficulty is that I haven't been able to reproduce the exact conditions that caused the issue in the first place, but I think I've improved the code now in a way that should eliminate the possibility of that condition occurring. Let me know how you get on. Many thanks for the update phkb. Added a "narrow" HUD variant which will engage if the game window ratio becomes too narrow for the widescreen display. In narrow mode, the seventh MFD is dropped, and the comms log and message log are moved so they don't overlap other screen elements. So players with 4:3 ratio screens can now use this HUD successfully! Added a cloaking indicator to the central HUD. Really changed medium level cabin temp color to orange, returned medium laser temp back to blue. 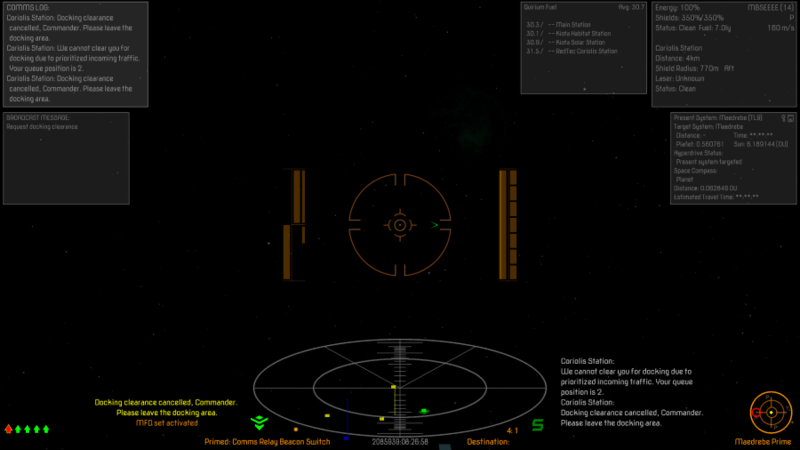 Added equipment space and cargo space dials to the docked HUD, for improved integration with Ship Configuration. Added ability to turn off fuel leak warning and cloaking device indicator via Library Config. Cleanup of Ship Configuration interface when HUDs are switched with HUD Selector. Added some missing functions to the HUD Selector integration routine. One thing that I've noted after installing the missiles and bombs oxp is that the icon for the regular standard missiles is either the same or very similar (getting old now - my eyes aren't that great) to the icon for AS-5 Blue Neon High Speed Interception Missile (the 50 cr injector missiles). I wondered if there was a way to distinguish the 2 (change of missile symbols or could the missile name be briefly displayed for a few seconds when toggling missile selection with "y" in the vacant space to the right of the missile cluster? Sorry for opening my big mouth - it feels like every time I do I'm creating work for you. Damocles Edge wrote: One thing that I've noted after installing the missiles and bombs oxp is that the icon for the regular standard missiles is either the same or very similar (getting old now - my eyes aren't that great) to the icon for AS-5 Blue Neon High Speed Interception Missile (the 50 cr injector missiles). I'll look at creating some original icons for the Missiles and Bombs missiles. Added "Amber" color mode, which switches all standard blue-toned HUD elements to an amber color (selectable via Library Config). Added some missing centre points to some crosshair images. Thanks to gsagostinho for some of the amber crosshair images, which I borrowed back from his Dangerous HUD's. I know, the MFD's and scanner are still grey. I might look at changing those in future versions. Thank you for all the effort you put in this game. Please, always feel free to borrow whatever you want from any of my OXPs. Ship Config armour values were not displaying correctly when they reached 0%. Added code to switch color of Manual Witchspace Alignment nav beacon (version 2.0 required). Some elements on the docked HUD were not being switched to amber color correctly. Some elements on the alternate HUD (used when viewing F5-F8 screens) were not being switched to amber color correctly. Target reticle now matches selected color scheme (blue or amber). Switched all white/grey elements to be the appropriate screen color (blue or amber), including scanner and MFD's. Crosshair information was not being correctly transferred to a new ship (standard purchase or via Ship Respray OXP). I'll update screenshots on the wiki shortly. One minor point I noticed though was that after using LMSS to switch fore laser, the aiming reticle does not change until I switch to an alternate view and then switch back to fore again. Damocles Edge wrote: Excellent work. Damocles Edge wrote: after using LMSS to switch fore laser, the aiming reticle does not change until I switch to an alternate view and then switch back to fore again. Fixed in the latest version of LMSS, available now. I've also just released a quick fix for Xenon HUD (taking it to version 3.3), that addresses an issue with the amber mode and Ship Configuration.